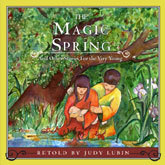 The Magic Spring is a story from Korea with soft and sweet lessons on kindness and second chances. A kind old man and his kind old wife have always wanted a child. Through the inadvertent help of their greedy old neighbor, they finally get their wish, along with a fresh start on youth. This story from Korea is Track 1 from The Magic Spring and Other Stories For the Very Young. Approximately 10 minutes.